I recently started painting. As a creative person I’ve dabbled in and experimented with several different media over the years. Along with performing arts, I’ve drawn and sketched avidly throughout most of my life and I’ve always wanted to try my hand at painting, a serious attempt far more than dabbling, but I never knew where to start and was always too busy with other pursuits to really explore this particular medium. Well, over the past year my life has changed in some pretty fundamental ways and I found myself at a point where I could finally focus on new pursuits. At first I wasn’t even sure what to paint. I knew that if I got any good at it I would probably paint similar things to the drawings I’ve done, full of traditional Native, historic, and arcane symbolism, heavily influenced by the natural universe, and mythology. I did some minimal research on the subject and gathered some basic supplies to get started. In the time I was taking to make up my mind I found an Eastern box turtle drowning in a small fish pond and rescued it. It was the same species that Creek (Muscogee) women use to make their shell shakers in the Southern states. The first night I kept him in a laundry basket before I eventually released him back into the woods behind my house. That night it dawned on me that the turtle was the perfect first painting to make. 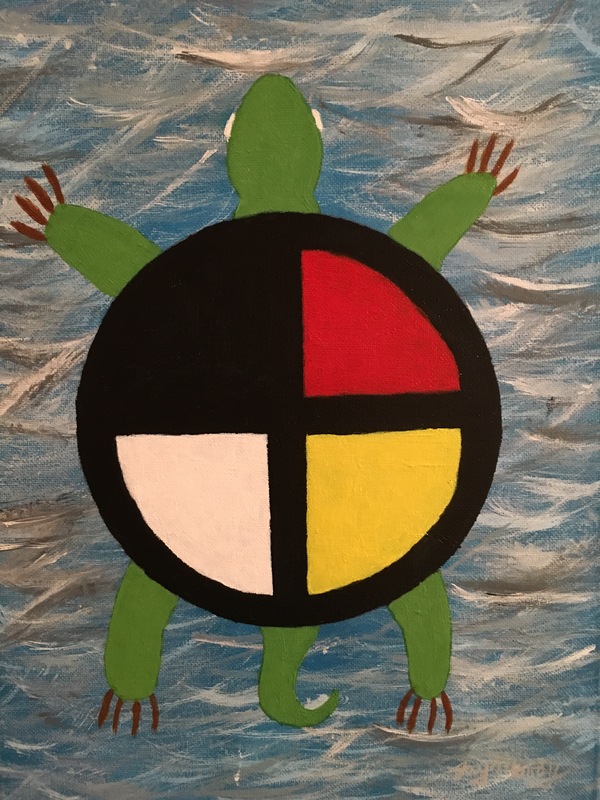 I came up in the Muscogee Creek tradition and in this tradition the Earth was created by the turtle. The turtle is the fundamental image of creation – the perfect symbol for art; and of beginnings – the perfect symbol for a new venture. And she is the perfect symbol to respect my heritage in which my life and creative pursuits tend to be grounded. I have worked for years under the name Lojah, anglicized from Loca which is the Muskogee word for turtle. As an enrolled member of the Cheroenhaka-Nottoway Tribe, my family belongs to the Turtle Clan,* so it all came together quite nicely. The Turtle would be my first painting. I opted for a traditional Native styled design that has been important to me for years with a medicine wheel on its back to represent the four directions similar to the images found throughout prehistoric and contemporary North American iconography. So with no instruction, a few meager supplies and a whole lot of inspiration I put paint to canvass and created this. I decided to start with a general background, something just to contrast with the turtle image. I mixed up a sort of amber colored yellow and painted the background. Then I laid the turtle down. I found the medium perplexing and unfamiliar so the brushstrokes are pretty obvious in places and the color isn’t as even as I intended for it to be, but overall I was pretty satisfied for my first attempt. I later realized that the background color resembles tanned deerskin and named it Buckskin Turtle. Naturally, my mother loved it and put in a request for one like it. It took me a little while before I got around to painting another one and by that time I wanted to make one for my sister too. I found my inspiration again and began painting. I decided to paint another turtle for its meaning to my family and to perfect the techniques necessary to paint something I expect to become a regular staple in my catalog. I decided that it needed a more dynamic background. Since the turtle represents the earth. I figured she should be represented in space kind of like a planet. The fact that I recently watched Star Wars Episode VII, the Force Awakens is purely coincidental. This second painting took a little more time than the first one, and I experimented a little bit more with techniques like layering and scumbling. This one has more breadth and depth than #1, and I was really pleased with the results. 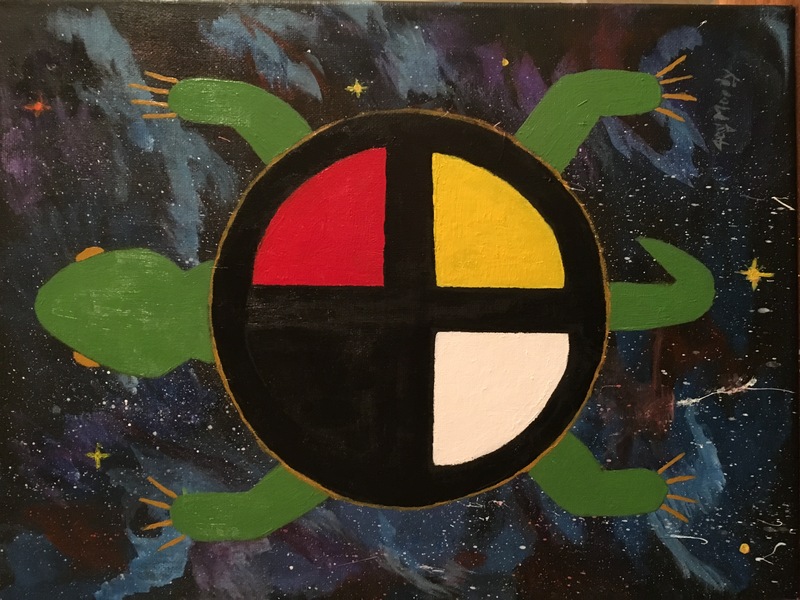 While painting Space Turtle I realized that I should do the next one on water, since the Creek Creation Story describes the turtle living in a world of water. I investigated techniques for painting water and experimented with the “z shape.” The water’s surface didn’t turn out quite like I had hoped, but the turtle was the best one yet. By the time I got into this painting I could tell that I was more comfortable with the medium. The colors are more distinct and smoother especially in the turtle. This one became my favorite pretty quickly. 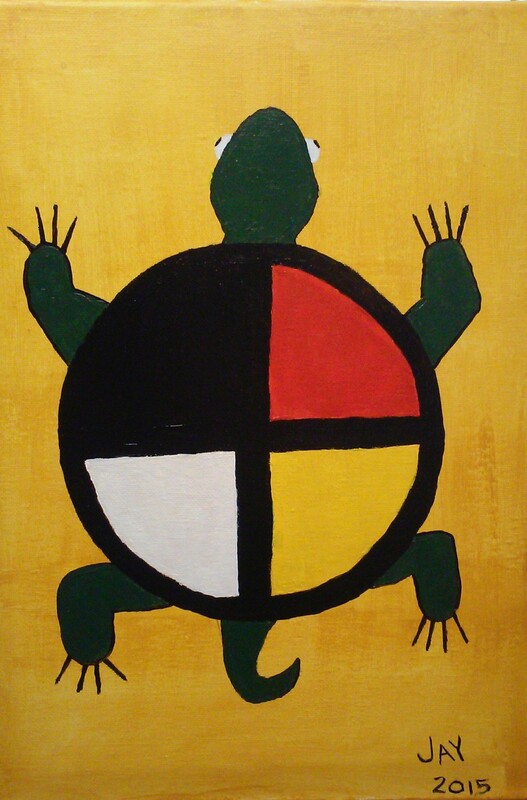 While painting Water Turtle I had a realization that before I painted anything else I should paint a fourth Turtle. Four is a special number to most Native American traditions and since I had already established that I was beginning this new trade upon a traditional foundation, I decided that I should complete the circle I had begun. 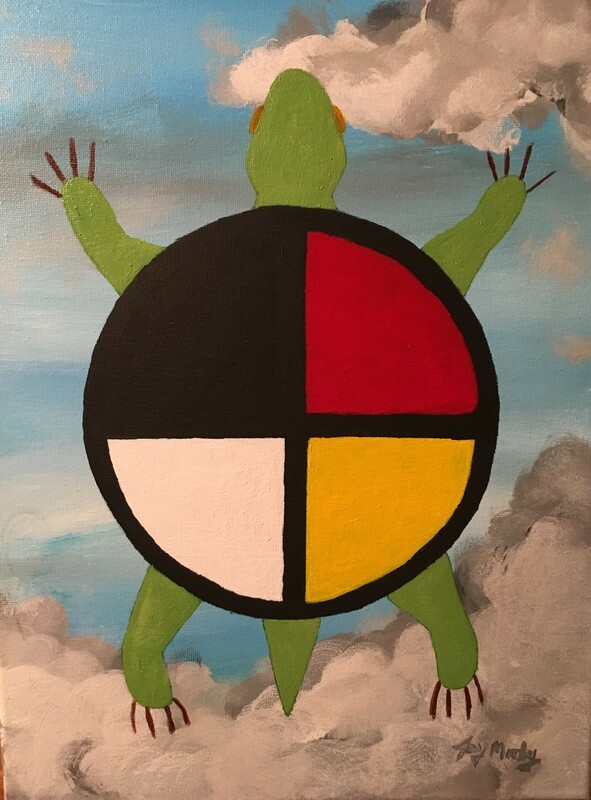 I painted this turtle on a sky background to represent the idea of the turtle as earth in a terrestrial atmosphere. My youngest daughter, Hailey says he’s flying. In my opinion this is by far the best one of the four. I was a lot more comfortable working with the paints, and I felt freer to let go of some of the rigidity I had in working on the previous paintings. These are my first four paintings. I plan to make a lot more, but I promise my next one won’t be a turtle. * Being of mixed Native American heritage and active in both communities I am a part of the Muskogee Creek Panther Clan as well as the Turtle Clan of the Cheroenhaka-Nottoway nation. Nice turtles! I belong to the Muscogee too. Can you tell me which compass points correspond to each of the colors? There are a lot of medicine shields out there with conflicting information. Hey, Melinda. Thank you for the compliment. I’m sorry I didn’t get back to you sooner, but I do not log in at wordpress very often and I only just saw your email. Unfortunately I can’t really say which color corresponds to which direction with absolute certainty because as you’ve already mentioned, it’s not consistent. They’re also not the Creek colors and more a Plains Indian style which has been adopted throughout Indian country. As I have come to understand it; Yellow is east. Red is South. Black is West. White is North. In the old Creek tradition it was different. East is white. South is blue. Black is west. Red and yellow are combined and come from the north.